Unlike last night’s entry, this is decidedly a Russian film intended for Russian audiences. We also know who produced it: Alexander Drankov, who would go on to found one of Russia’s first major production companies, and who collaborated with Vasily Goncharov on the script. Like many early silent pictures, it relies somewhat on the audience’s prior familiarity with the subject matter to make sense of the story. Stenka Razin was a well-known figure in Russian folklore, a rebellious Cossack leader who defied the Czar and his bureaucrats. This movie was also based on a folk song which elaborates the story, which we only see as vignettes. The song informed the audience’s understanding of what they saw, but the movie also had music written specially for it, which was novel at the time (Wikipedia claims both that this is the “first” Russian narrative film and the “first” musical score for a movie, but I’m leery of “firsts” and will not pronounce for certain on either point). 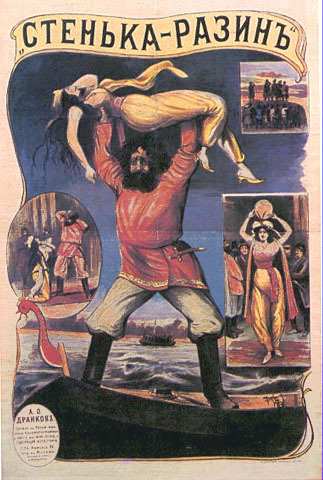 Stenka is in love with a Persian princess he has taken prisoner in a raid. We see him sail up the Volga with his fleet of raiders, back to the home base, along with the Princess, who performs a dance when they arrive, symbolizing their wedding. The other bandits are concerned about their leader coming under her spell and they plot to make him drunk and jealous. They forge a note from a Persian lover and Stenka becomes enraged. He drowns the princess in the Volga for her presumed infidelity. 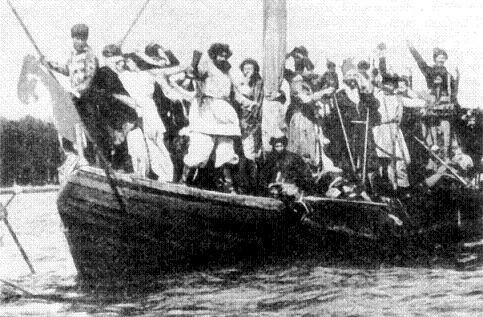 The movie ends at that point (assuming that what we have today is complete), but the song lets us know that the men are horrified by what they’ve done, but Stenka calls out for more wine and celebration, then ends on the same refrain of the boats sailing up the Volga that was at the beginning.